Sistership, a sailing school for women, couples, and families, offers the opportunity to learn the sport of sailing in a positive, relaxed, supportive environment. 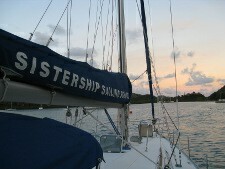 Sailing from Nanny Cay Marina on the island of Tortola in the British Virgin Islands, Sistership Sailing School provides you with a unique vacation experience. Using a liveaboard format our courses provide hands-on participatory learning experiences for the entire crew. Our classes for women combine the pleasures of a tropical Caribbean paradise with the camaraderie and support that naturally come along with a women-only learning experience. Our couples courses teach you how to best work as an effective team. The confidence gained in each other can enrich your relationship far beyond the sailing experience. Our family courses provide a safe, fun way to introduce your children to the world of sailing. Starting the family off on the right foot is crucial to their future participation in, and enjoyment of, sailing. In a typical week we visit up to seven islands, mooring in a different beautiful harbor each evening. In addition to our regular curriculum, which includes boat handling under sail and power, navigation, anchoring, docking, boat systems and safety procedures, there will be time to swim, snorkel, beachcomb and stargaze. Sistership is much more than a sailing trip, more than lessons learned, it's a life experience. Come join us for the time of your life! Produced by Graphic Design (BVI) Ltd.